You might be wondering what we in COCO get up to when we’re not filling screens with your favourite TV shows. If you haven’t seen a COCO production on screen recently, you’d be excused for thinking that this is our quiet time, that we’re taking the Summer months to kick back, relax and enjoy the sun while we patiently wait for the likes of First Dates and Room to Improve to return with a brand new series. The reality for us in COCO, as it is for most in the world of TV, is that the ‘downtime’ between programme transmission dates represents the period in which the majority of the heavy lifting is done. Here in Ranelagh, chirping birds and that most familiar summer sound of ice-cream van jingles have been drowned out by the noise of fresh ideas being brainstormed; recces, shoots, and interviews being organised. It might not it seem like it for anyone who’s keeping one eye on their TV screens in eager anticipation for our next production, but it’s all kicking off in COCO. Trust us! 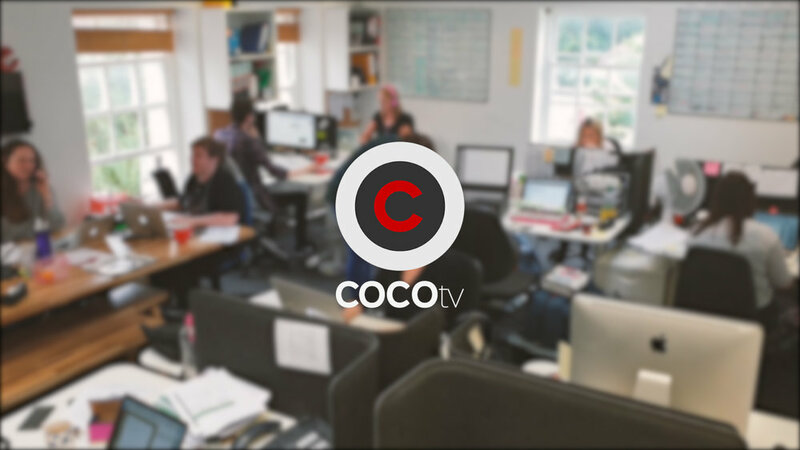 The COCO team busy at work. If you’ve been following us online, you’ll probably have seen a callout or two seeking applications for the new First Dates series. With the application form for series four officially opening up again way back in March, we’ve spent the past few months on the lookout for another batch of singletons to join Mateo, Alice, Ethan and co., in the First Dates restaurant for some romantic dining, drinks… and maybe a bit of drama. Okay, definitely a bit of drama. Our team of ‘Casting Cupids’ are currently working their way through the thousands of applications we received for this series, conducting countless phone interviews to identify the most suitable candidates to be brought into the restaurant where they’ll meet their carefully selected match. A couple of weeks ago, we rolled out the iconic red heart backdrop and began shooting interviews with potential daters, so it’s fair to say that the new series is well underway. Who will be taking a seat for series 4? 🤔 ❤ #FirstDatesIRL filming is officially underway. There’s still a lot of work left to be done, however. Although we’ve been casting since March, matchmaking is a long and careful process (we aim to get the absolute best matches for all our daters), so we’re still working away to find the everyone their ideal date. We’ll have all our daters selected by mid-August, at which point we’ll take to the Gibson Hotel with our full crew, restaurant staff and our specialised hidden-camera setup. Then it’s time to crack open the champagne and let the dates begin. From here, we’re in for an extensive, several-month-long editing process in which the dates are stitched together and graded for your viewing pleasure. You can expect to see the brand-new series on RTÉ2 point in early 2019. Since the most recent series of Room To Improve wrapped up in April, we’ve overheard a few regular viewers comment about how their Sunday nights haven’t been the same since. The good news for fans of the show is that production for the new series has kicked off already. The bad news is that it won’t be until August 2019 that the series will be ready for air. There is more good news though: knowing Dermot, you can be sure to see some pretty spectacular makeovers, brilliant builds, some fascinating characters, and of course, plenty of Dermot’s signature super-sized windows, once the show returns. If you can’t wait that long for your fix of home makeover programmes (‘Fix’, get it? ), you can expect to see the return of Desperate Houses before the end of the year. Unlike Room to Improve, Desperate Houses is filmed over three days per makeover. With casting ongoing and our first few makeovers already wrapped, it’s full steam ahead for Róisín, Peter the Builder, and the Desperate Houses Clutter Busters along with the show’s sponsor, IKEA. Mark your calendars for October 2018 when the new series is scheduled to hit RTÉ One. From cluttered homes to spectacular homes, Dermot Bannon will be back on tour to visit some of the most incredible homes, buildings and general architectural delights from around the world. Following on from last year’s two part-special in which Dermot took us on an architectural tour of New York and L.A., this year we’ve set our sights on what London and Australia have to offer. With filming in London already done and dusted, we’re currently gearing ourselves up for a visit to the land down under in September. This is certainly one to keep an eye on! Make sure you’re following us on social media for any updates on when you can expect this special to air. So, there you have it. There’s a lot going on behind the scenes. Here’s an overview of the key milestones coming up over the next while so you can keep track of what’s going on and when.